The 2013/14 Premier League season is over. Manchester City have been crowned the Champions of England for the second time in three years, while Liverpool finished second. It was an amazing season for the Reds, who surpassed all expectations to reach this far. Liverpool have made a gigantic progress under Brendan Rodgers, with hope and pride restored at this iconic club once again. On an individual note, the club should cherish some of the brilliant solo performances of their players. Luis Suarez, who has won the PFA and PFWA player of the year already, has been awarded the Golden boot for scoring 31 league goals this season. The Uruguayan, who missed the first five games of the season through suspension, has also bagged 12 assists to his name. 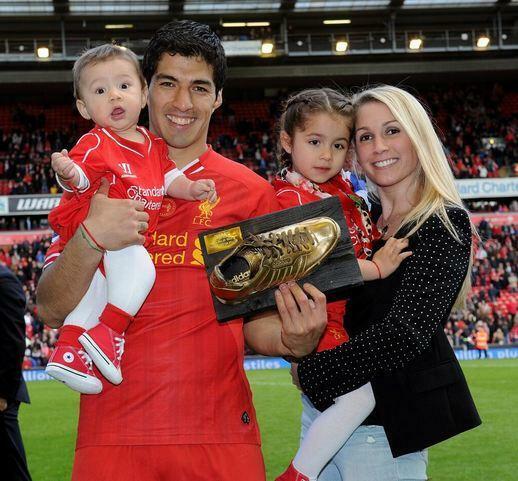 Take a look at this picture, where he poses with his family holding the Golden Boot with his right hand. congratulations to all LFC family! but BR should go for a defensive tactics training. Congrats to my beloved Reds.. Comparing with City champions is depressing, majority foreign players, what is there to be proud of Man City! Congrat to luis suarez but i want u to stay wit liverpool. Don’t any where, i luv ur tactic. When suarez caught d ball with his hands, was penalty not given 2 Ghana? Was suarez d reason why Gyan could not score the penalty? My friend shut ur trap nd learn 2 appreciate one’s effort okay. SUAREZ I LOVE U…..
and am i the only one who knows that isnt the BPL Golden Boot….